Sarah Pekkanen is always good for a novel about a family or marriage crisis. Things You Won't Say is no different. I cannot imagine how a spouse feels when their husband/wife straps on a service weapon and leaves home for a day of duty. For Jamie Anderson, she tenses up every morning. Will he be okay? Will he come back home safely? Then came the call she always dreaded. There was a shooting at the police headquarters. Her husband Mike isn't hurt but his partner is injured. Mike may not have been the officer injured but he is an invisible casualty. Mike seems disconnected, paranoid, has insomnia and overly cautious. A slightly ajar door means an intruder when in reality the dog slipped outside. Mike is obviously affected and Jamie is unsure how to help him. Unfortunately Jamie gets another call. There has been another shooting. This time, Mike pulled the trigger. It alters their world and Jamie tries to hold the family together. 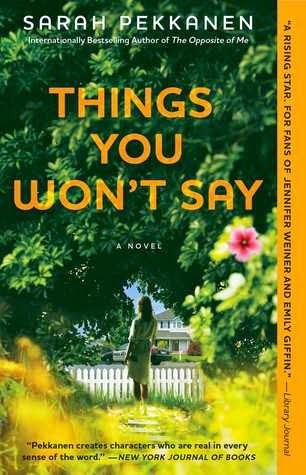 Things You Won't Say is closer to current events than the average women's fiction novel. Sarah Pekkanen has a way of writing realistic stories. This book may be fiction but is a reminder how one incident affects more than the immediate lives involved. Things You Won't Say will be released next week on April 21, 2015. It is not Sarah Pekkanen's best book in my opinion but worth reading if you are a women's lit fan. Sounds like a realistic piece of fiction especially considering the recent killings in the news. I couldn't imagine having to consider the life of my partner and worrying for his safety every single day because of the nature of their job. I like that the shooting affected his life even though he was not the victim. It's a great way to show how events and people can have far reaching and unexpected effects and consequences. We all take risks leaving out the door every morning but I couldn't imagine worrying for a spouse's safety every day either. Well said, Jade, how events have unexpected effects.